We love Ice Resin! This fabulous resin is our sealer of choice for our painted pendants and charms. We also use it in cabochon or tray projects to seal in photos and other memoribilia. We carry the 25mL plungers that have the hardener and resin in seperate compartments, this make it easy to get the exact measurements when pouring and mixing. 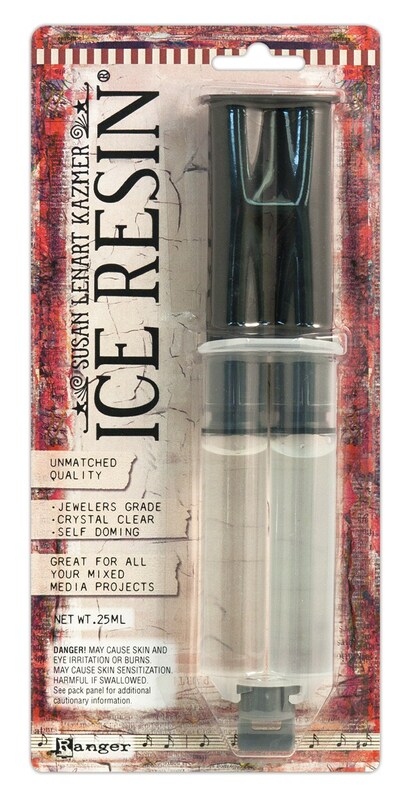 ICE Resin® is a Jeweler’s Grade, naturally doming, self-leveling & healing, crystal clear resin. Ice Resin® is a 2-part epoxy resin: Part A is the Resin and as a slightly blue tint. Part B is the hardener and has a very slight yellow tint. Part A and Part B must be poured with a one-to-one ratio and mixed gently but thoroughly for ICE Resin to dry and cure properly.